Tropical Storm Kills Nearly 1,000 In Philippines : The Two-Way Tropical storm Washi kills nearly 1,000 people in the Philippines because of its heavy rainfall. People didn't escape. President Benigo Aquino vows an investigation into why the death toll is so high. Philippine Navy personnel prepare coffins for shipping to Mindanao Island after tropical storm Washi hit the country last week in one of the worst disasters to strike the region in decades. The United Nations is rushing food, shelter and clean water to the Philippines, following last weekend's devastating tropical storm. The UN estimates about 1,000 people died when Tropical Storm Washi burst ashore last Friday on the big southern island of Mindanao. Washi, known as Sendong in the Philippines, may be the world's deadliest storm of 2011, according to Washington Post meteorologist Jason Samenow. The system raked the southern Philippines islands, finally emerging in the South China Sea, where it lost strength. 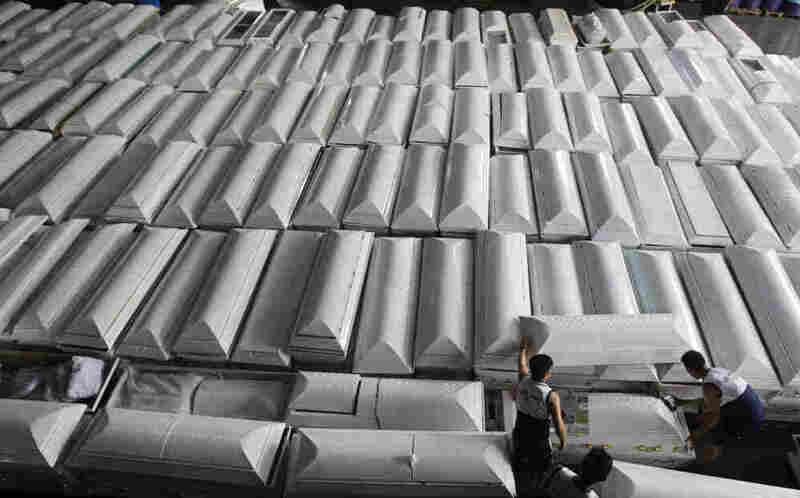 Philippines president Benigno Aquino declared a state of calamity and ordered coffins sent to the two cities worst affected by the storm, Iligan and Cagayan de Oro City. AP reports he'll order an investigation to find why more people didn't seek higher ground and the reason for the high death toll. While visiting Cagayan de Oro, he said "Our national government will do its best to prevent a repeat of this tragedy." Victims need the aid. According to Mindanao News, survivors in Cagayan de Oro City should look for missing relatives in the city's dump, where dozens of bodies have been left because local funeral parlors don't have enough coffins or embalming fluid. Washi, which never gained hurricane strength, held lethal power in its tremendous rainmaking ability, according to Physorg.com, which notes some areas got 16 inches of rain. Hundreds of people drowned in flash flooding while others perished in sudden landslides, which reportedly engulfed villages. The UN's representative on disaster risk reduction says a lot more education is necessary in the Philippines to warn of dangerous storms and to help people flee to higher ground when an alert sounds. But the representative pointed out vulnerable Filipinos face a second dangerous mix of "poverty, rapid urbanization and deforestation."